Tell us about your applications and problems. Our team will find the perfect solution. 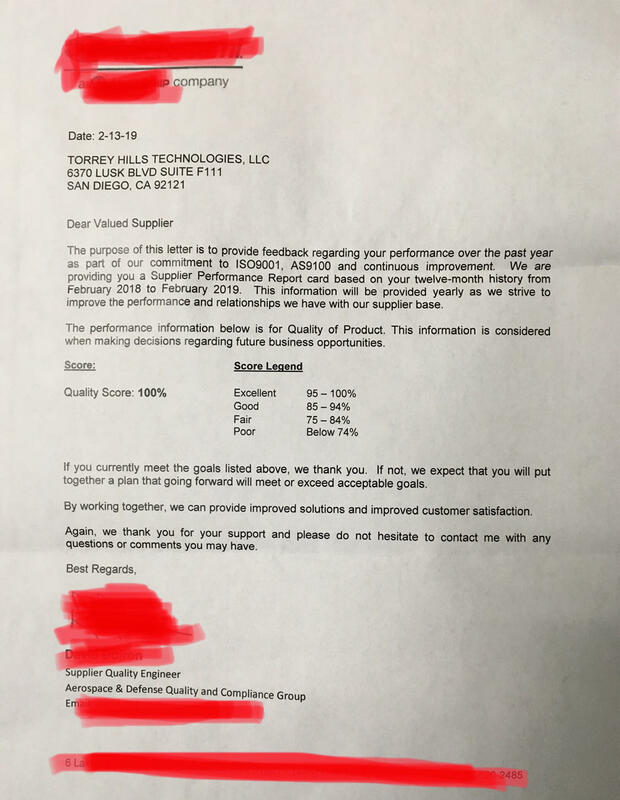 We recently received a scorecard from a major Aerospace and Defense customer that assessed the quality of our CuW and CuMo heat sinks. Click here to view the entire scorecard. 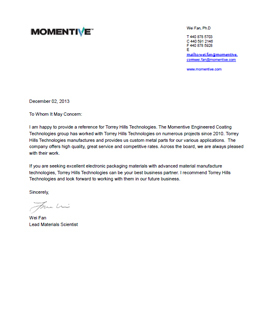 "The Momentive Engineered Coating Technologies group has worked with Torrey Hills Technologies on numerous projects since 2010. Torrey Hills Technologies manufactures and provides us custom metal parts for our various applications. The company offers high quality, great service and competitive rates. Across the board, we are always pleased with their work. If you are seeking excellent electronic packaging materials with advanced material manufacture technologies, Torrey Hills Technologies can be your best business partner. I recommend Torrey Hills Technologies and look forward to working with them in our future business." "We’ve been using Torrey Hills heat spreader technologies for RF power amplifier applications for 4 years with great success. Torrey Hills technologies provided the deep knowledge and experience required to help educate us on the many nuances related to heat flow, metallurgy, gold-plating, packaging and how it all relates to our unique RF-Microwave power applications. They helped support our efforts through: R&D, to prototyping, to final production quantities. They always delivered on time, were proactively advising us during R&D, and enabled numerous product success stories. Torrey Hills literally wrote the books on the materials science related to RF-Microwave packaging; they are the world’s expert in this field." "This is to testify that our relationship with Torrey Hills Technology can be characterized as friendly, professional and profitable. The products provided to Polyfet RF Devices consistently met our quality standards. Communication between our companies was open and professional and issues were dealt with on a timely manner. Their prices are so competitive that they helped us reduce manufacturing cost dramatically. Delivery is usually faster than comparable manufacturers and is always on time. We consider Torrey Hills Technology a highly recommended business partner."